Low volatility does not mean low risk! In an environment characterized but high political and policy risk, low levels of market volatility seem paradoxical. Volatility expectations for stocks and bonds have sunk to levels not seen since 1990. 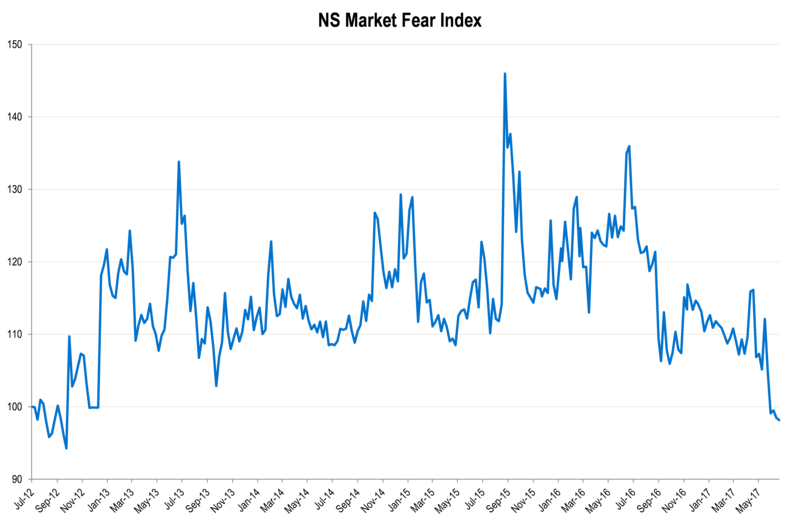 The VIX Index, which reflects a market estimate of future equity volatility, traded below the psychological level of 10 during 16 days this year (it only occurred 35 times since 1990) and the MOVE Index, which measures bond volatility, reached its all-time low recently. On the macro side, low interest rates have encouraged investors to buy assets boosting their prices and in turn reducing volatility. With QE, central banks have put a floor under global asset prices with unprecedented balance sheet expansions. Finally solid economic growth with contained inflation means little reason for prices to move significantly. Market participants have changed their way of investing with large inflows into passive investment solutions like index-trackers and ETFs across all asset classes and the growing popularity of low volatility/diversified risk premia funds. Due to regulation, banks and insurers have invested massively into Government bonds to the detriment of “traditional risk” assets. Finally, algorithmic trading represents more and more of daily market volumes and machines are able to capture short term moves or inefficiencies, which mean smaller and fewer swings in prices before equilibrium is found. But this doesn’t mean low risk! In asset allocation models, exposure to risky assets have increased over the last few weeks as low volatility is a mathematical driver of trade sizing codified in hundreds of billions of risk managed investment strategies. This false signal of safety could result is an inability for investors to appreciate how quickly market conditions could change, which make trading strategies more vulnerable to unwinding and amplifying a risk-off event. At the Notz Stucki Group, the Asset Allocation Committee decides of the asset allocation of managed portfolios. A balanced portfolio currently shows the following allocation: 50% equities, 25% fixed-income and 25% absolute return strategies with little cash. The NS Market Fear Index (please see above) is a fusion of volatility indices on equities, fixed-income, currencies and commodities with a similar weighting in each asset class as we have in the balanced portfolio over time. The recent levels reached by the NS Market Fear Index are among the lowest for the last 5 years. But we are aware of the situation and are acting accordingly. First, we adapt our asset allocation in function of the changing market environment and we don’t hesitate raising cash if needed. Secondly our main focus is active management and we are invested both internally and externally with flexible independent asset managers who try to preserve capital. Finally, we bought some puts in equity portfolios, have maintained a short duration in fixed-income products, decreased the exposure to managers with higher leverage and keep a 25% allocation to absolute return strategies which are less sensitive to periods of risk off and volatility spikes. Previous Chart of the Month - Japanese Yen: to hedge or not to hedge?